Green Army Fraction, well known for his premium euro-style power-electronics, discovers new territory on this neat C30. The a-side houses one single track, clocking in at 14:33. „Ahura Mazda I“ is constructed of distorted, but not very harsh, noises in the background with ambient-style keyboard-layers on top. The rumbling foundation has a nice, fucked up lo-fi sound and makes use of some heavy bass-frequencies and rumblings, with some more mid-oriented distortion-textures popping-up occasionally. On the top of the noise there are calm and crystal-clear synth-layers, with an almost bell-like sound at times, creating a very ambient-like atmosphere. The contrast between back- and foreground works out fine. No vocals on this track. The b-side starts with the title track. Classic power-electronics, just what you expected of GAF. Noisy pulsating textures, screeching feedback and aggressive and shouted vocals, processed with some reverb and/or delays. Next is „Ahura Mazda II“, which is centered around a chanting choir that gets accompanied by a chaotic rumbling texture of bass-heavy noises, which almost drowns the choir completely. Again, a lengthy track with 10:30 minutes running time. 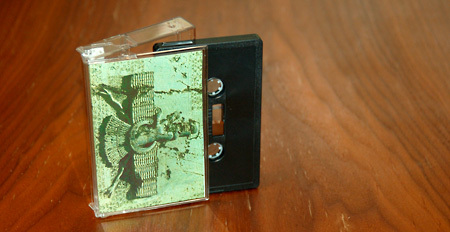 The tape comes with a full-color inlay with some nice and atmospheric artwork. There are no printed lyrics included or any other information on the concept, but an internet-search showed that „Ahura Mazda“ is the one god in Zoroastrianism and he is found on Persian, Armenian and Georgian language. The concept of „Airyanem Vaejah“ deals with the expansion of Zoroastrian territory and is considered to be the perfect land. When I read about it it somehow reminded me of the concept of eternal winter and thule. Anyway, the music on this release is done very well. Though it may not be the typical GAF-sound the three songs are very strong and it will be interesting to follow the future development of the project to see which direction it is going to take.